POSTED January 24, 2019 9:37 a.m.
MONROE — Juniors Tristen Gilbertson and Will Schaefer claimed titles for the Belmont/Platteville co-op at the annual Monroe Wrestling Invitational held at Monroe High School on Saturday, Jan. 19. Gilbertson (22–8) pinned his way to the 113-pound crown to claim his first career title from the event following back-to-back runner-up performances the previous two season, while Schaefer (30–3) dominated on the way to capturing the 195-pound crown– also his first Monroe title– and he was named the Outstanding Wrestler of the Meet following the competition by the coaches. Following a first-round bye, Gilbertson pinned Cuba City/Benton/Southwestern’s Trevor Oman in 3:42 to make the finals at 113, and then stuck Poynette’s Gwen Golueke in 1:22 to take the championship. Schaefer also opened his day with a bye and a 59-second pin over Parkview’s Chase Carratt to make the finals at 195, and he locked down the crown by registering an 8-0 major decision over Beloit Memorial’s Tyler Sireci. “Will has been wrestling well all year, and does all the right things both on and off the mat. To see him come home with the Outstanding Wrestler award was very nice, and is just another confidence booster for him going into tournament time and his ultimate goal,” commented Braves’ head coach Emeric Williams. Senior Christopher Gillen (12–2) and junior Brady Johnston (18–9) made the finals for the Braves at 132 and 138, respectively. Gillen opened with a bye and a 1:01 pin of Memorial’s Carlos Lopez, but he was denied the title when he was pinned by Poynette’s Blake Shallow in 4:50 of the championship match; while Johnston pinned Memorial’s Marco Olivera in 1:50 and posted a 15-0 technical fall over Oregon’s John Ruth to make the finals at 138 where he fell to third-time champion Kolbe Ubersox of Darlington/Black Hawk by fall in 51 seconds. Freshman Dylan Taber (18–11) at 126, senior Trevor Heim (9–15) at 152 and sophomore Michael Douglas (27–8) at 285 all went 3-1 on the day to place third for the Braves, and junior Shannon Gill-Mast (11–17) placed fifth for the team at 160. The host Cheesemakers captured the team title at their own meet with 187.5 points. The Braves, who filled just eight of the 14 weight classes, pulled in third with 146.5 points behind Darlington/Black Hawk at 150.
to a 42–36 win over River Valley on Jan. 6, 2012. “The conference win over Dodgeville was huge for us as a program and the direction we want to be going, and it shows our continued improvement. Despite it being such a significant win for us, I know the team is not satisfied with that and has just made them hungrier for more,” said Williams. Securing pins for the Braves were Tanner Paulson in 3:45 at 126, Dylan Taber in 3:41 at 132, Gillen in 3:41 at 138, Johnston in 1:43 at 145 and Schaefer in 3:53 at 195. 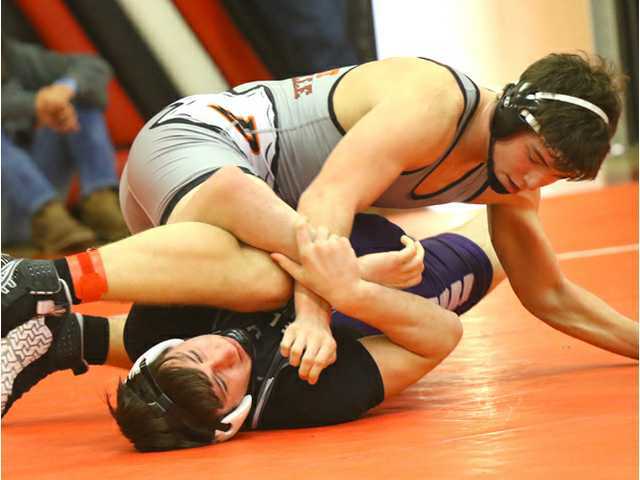 Freshman John Burbach posted a 7–0 decision over Drew Palmer at 120 and Michael Douglas earned a hard-fought 1–0 decision over Louden Fuerstenberg at 285 for the Braves, while Gilbertson at 113 and Gill-Mast at 160 picked up forfeit wins to aid the victory. Belmont/Platteville will host River Valley in a SWC dual meet at Platteville High School on Friday, Jan. 25, at 7 p.m. Team Standings: Monroe 187.5, Darlington/Black Hawk 150, Belmont/Platteville 146.5, Beloit Memorial 132, Cuba City/Southwestern/Benton 124, Poynette 119, Oregon 112, Parkview 87, Clinton 48. Belmont/Platteville Individual Results: 113-pounds- 1- Tristen Gilbertson, 3-0; 126- 3- Dylan Taber, 3-1; 132- 2- Chris Gillen, 2-1; 138- 2- Brady Johnston, 2-1; 152- 3- Trevor Heim, 3-1; 160- 5- Shannon Gill-Mast, 1-2; 195- 1- Will Schaefer, 3-0; 285- 3- Michael Douglas, 2-1. Individual Results: 113-pounds- Tristen Gilbertson, B/P, won by FF; 120- John Burbach, B/P, dec. Palmer, 7-0; 126- Tanner Paulson, B/P, pinned Roen, 3:45; 132- Dylan Taber, B/P, pinned A. Phelan, 3:41; 138- Christopher Gillen, B/P, pinned Dougherty, 3:41; 145- Brady Johnston, B/P, pinned Thompson, 1:43; 152- Crook pinned Trevor Heim, B/P, 0:12; 160- Shannon Gill-Mast, B/P, won by FF; 170- Ty. Bell, D, won by FF; 182- Ta. Bell, D, won by FF; 195- Will Schaefer B/P, pinned Recob, 3:53; 220- Hlavac, D, won by FF; 285- Michael Douglas, B/P, dec. Fuerstenberg, 1-0; 106- Double FF..